Thunderbird Entertainment | TV, eh? Thunderbird Entertainment Group Inc. (TSXV:TBRD) (“Thunderbird” or the “Company”), a global multiplatform entertainment company with offices in Los Angeles, London, Vancouver, Ottawa and Toronto, is pleased to announce the hit series Highway Thru Hell has been commissioned for an eighth season on Discovery Canada. The new season will consist of 17 inspiring episodes and begin airing in late 2019. Highway Thru Hell follows the heroes of the highway as they fight to keep some of the most economically important and inhospitable trucking routes in North America open to traffic. The current season airs Tuesday nights on Discovery Canada. Highway Thru Hell is Discovery’s most-watched factual series, dominating Canadian entertainment specialty channels in its timeslot. Thunderbird has produced more than 100 episodes of Highway Thru Hell and its spinoff series Heavy Rescue 401. The series can be watched in over a dozen languages in more than 170 countries worldwide. Highway Thru Hell has consistently attracted impressive audiences, ranking as a Top 10 series on entertainment specialty television in Canada for total viewers and the A25-54 demographic. The series has made Discovery Canada the most-watched entertainment specialty channel in its timeslot among total viewers as well as the A25-54 and A18-49 demographics. Highway Thru Hell is produced by Thunderbird Entertainment Group Inc. in association with Discovery Canada. Wendy McKernan is the producer and Neil Thomas the series producer. Thunderbird Entertainment announced today that they have optioned Cherie Dimaline’s award-winning novel, The Marrow Thieves. The book, which won The Governor General’s Literary Award for Young People’s Literature – Text and the Kirkus Prize for Young Readers last year, will be adapted as a limited series for television. The Marrow Thieves takes place in a not-too-distant future after humanity has nearly destroyed the world through global warming. An even greater evil lurks: the Indigenous people of North America are being hunted and harvested for their bone marrow, which carries the key to recovering something the rest of the population has lost— the ability to dream. In this dark world, sixteen-year-old Frenchie and his companions struggle to survive as they make their way up north to the old lands. For now, survival means staying hidden — but what they don’t know is that one of them holds the secret to defeating the marrow thieves. Despite the bleak future depicted in The Marrow Thieves, it resonates with a message of hope, loyalty and belonging. “We were thrilled when Thunderbird expressed interest in The Marrow Thieves, but our thrill quickly gave way to the genuine enthusiasm and excitement Alex Raffé brought to our discussions. We could not imagine a better home for the book’s characters and story,” said Marc Côté, publisher of Cormorant Books. The best-selling book was a CBC Canada Reads selection, has spent eleven weeks on the Globe and Mail bestseller list reaching #1, received starred reviews from Quill & Quire, Kirkus, School Library Journal, and Booklist. The Marrow Thieves was one of the Globe and Mail 100 Best Books of 2017 and is currently shortlisted for the White Pine Award. 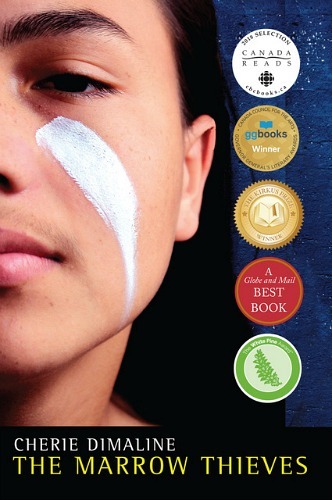 It was named one of the top ten books by the Ontario Library Association and was named an Honour Book by the American Indian Library Association. “Because The Marrow Thieves has become an important work for the Indigenous community, it was essential to find a team who could bring this story to life with a commitment to honour its messages and worldview. Thunderbird has made such a commitment and I am happy to be working with them as this project comes to life and gains an even larger audience,” said author Cherie Dimaline. Linda Saint of The Saint Agency arranged the deal with Thunderbird’s Senior Vice-President Scripted Production Alex Raffé.